Is deconstructed PACS, VNA, or enterprise imaging the best way to manage your imaging data? Remember when PACS was the sole domain of hospital radiology departments and imaging centers? A lot has changed since PACS was introduced in the late 1970s and became de rigueur throughout medical imaging in the ’80s and ’90s. Today, in most health systems and imaging facilities, PACS is only a small part of medical imaging workflow and storage, and many organizations, if they haven’t yet, are ready or in need of replacing or upgrading their PACS. 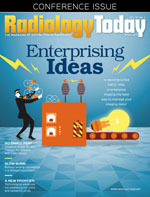 A number of things have changed that make single-vendor, standalone PACS in the radiology department obsolete, says Michael J. Gray, of Gray Consulting in Novato, California. One is that more radiologists are reading for health systems with multiple hospitals or multiple imaging centers and need to be able to retrieve and store images from multiple sites using varied equipment from multiple vendors. Another is that a growing number of “ologies,” from cardiology to ophthalmology to dermatology and even pathology, are taking and using images that are part of their patients’ records—records that need to be accessible as well as archived, says Don Dennison, FSIIM, president of Don K. Dennison Solutions, Inc, in Waterloo, Ontario, Canada. And then there’s the implementation of EHRs. The government mandated EHR implementation by January 2014, under threat of penalties. Today, physicians want to see all relevant patient images at the same time as they view lab results, health history, and other information from the EHR. Which brings us to where we are today: More than ever, the need is for enterprisewide imaging and not just PACS in radiology or even in radiology and cardiology. Two paths to achieve enterprise imaging have received a lot of attention and been widely debated in the past few years: deconstructed PACS and vendor-neutral archives (VNAs). Definitions of the two may vary, but, generally, a deconstructed PACS involves getting all of the pieces—viewer or image manager, worklist, archive—from more than one vendor and piecing them all together, Dennison says. A VNA, says Harold Welch, vice president of technical solutions worldwide for Novarad Healthcare Enterprise Imaging in American Fork, Utah, is a way of archiving multiple objects from PACS and retrieving them easily, as needed. “So, it’s more of a protection layer than anything else,” Welch says. So, what are health systems and imaging centers looking at when it comes time to replace their first or even second or third PACS in 2019? Here’s what some facilities/health systems have chosen and some advice from consultants and enterprise imaging experts on the best route for the needs and size of your facility or department. Gray says a lot depends on whether your organization is an early adopter or is just now debating what to do. For decades, he says, vendors of radiology PACS have had a lock on the data contained in them and, therefore, a lock on the customer. Five to eight years ago, he says, early adopters “got fed up with being owned by the vendors and said, ‘We’re going to do something different and make it easier for us to do these migrations.’” Their demand gave rise to the VNA, which had “the magical capability” to normalize data and allow the exchange of images among different vendors. It is also important to appreciate that whenever an organization changes the system/component that is storing/managing the image data, be that a department PACS or a VNA, the image data will most likely have to be migrated to the new system, Gray says. “The solution to this problem is to make sure that the incumbent PACS or VNA vendor has included the image data migration software in their original software package, and the legal rights to either use this software to migrate the image data or allow for a separate, outside consulting/services firm to use this software to migrate the data,” he says. Most early adopters are larger institutions with large IT staff who can handle the issues that arise when using different vendors for different parts of the image archiving and communication systems, Gray says. He adds that most organizations faced with decisions today about how to implement enterprise imaging are not early adopters. They tend to be smaller organizations with smaller, less experienced IT staff. Those who have become “less and less early adopters” want to buy all their parts from one vendor, Gray says. “They want their systems to be bundled so it’s one call to make” and one vendor to deal with in implementing and servicing the contract. “If you’re a smaller organization that doesn’t have IT experience, you’re better off buying something with the fewest number of vendors involved in the pie,” he says. Cost is also an issue. Buying the different parts from different vendors—a best of breed strategy—is always going to cost more than buying everything from one vendor. “Best of breed is wonderful but it’s always multiple vendors, and it’s always expensive,” Gray says. Every vendor wants their piece of the revenue, and not only can the individual pieces be more expensive upfront, they will cost more to run and maintain because you’re paying four vendors vs one, he explains. Having four different vendors provides more flexibility than buying all four components from the same vendor. And, if something phenomenal were to hit the market soon after your purchase, you wouldn’t have to worry about waiting until you got your return on investment to upgrade or replace that component with the latest and greatest, Gray says, as opposed to replacing all four or five components, which would likely be cost prohibitive. Dennison agrees that the smaller or simpler an organization is, the more one system makes sense. “If you’re a single hospital, or a regional system with three or four facilities, and you already have everyone on one PACS, to replace that whole PACS with another PACS is not that hard, especially when compared to taking that PACS and breaking it into four or five pieces and putting it back together,” he says. Another option is a hybrid, where you have one PACS for everyone in radiology and one for cardiology, etc. “Everyone is on the PACS they like but they can share images via VNA,” Dennison says. It is true, however, that once a PACS vendor has locked in a health system, the vendor knows it would be difficult for the health system to replace it. “The vendor is often the only one qualified or allowed to perform some services on the system, allowing them to demand premium professional services rates,” Dennison says. “And so some health providers feel that they’re being taken advantage of.” Good quality service and support, at a fair price, is possible in either deployment model, Dennison says, but many health systems perceive that they will get better service from VNA and similar “deconstructed” solution component vendors than they will from PACS vendors. Joseph L. Marion, of Healthcare Integration Strategies in Waukesha, Wisconsin, offers his client in New Hampshire, Elliot Health System (EHS), as a good example of how smaller organizations are handling the issue. “From my experience, dealing on a departmental level can mean separate PACS solutions, whereas elevating requirements to an enterprise level can mean there is a need for common components such as a VNA, universal viewer, or advanced visualization that cut across departmental PACS,” Marion says. EHS is the largest provider of comprehensive health care services in southern New Hampshire, the cornerstone of which is Elliot Hospital, a 296-bed acute care facility located in Manchester. EHS uses images in multiple departments—eg, radiology, cardiology, and gastroenterology—and, with Marion’s guidance, concluded it needed to develop an enterprise strategy to be able to store and view these images across these multiple service lines. At the same time, EHS’s PACS was going to sunset, and it needed to do something. “The radiologists were not enamored with the PACS we had,” says Richard Frechette, RT (R)(CRA), director of diagnostic imaging at EHS. Besides, he says, going with the same vendor was not an option. In the end, the health system opted for a PACS from a single vendor and an enterprise VNA from that vendor as well. The health system decided that owning its own archive data was critical to whichever solution it chose. Another example comes from Carestream: Saint Francis Healthcare System in Cape Girardeau, Missouri, which serves a five-state region through its 306-bed medical center, bought its first PACS in 2004. In 2015, it had to go searching for a new one. “We always wanted to get a PACS system that would include all of the ‘ologies’ and not just radiology, and we wanted them to be in one archive solution,” says David Forsythe, RT (R)(CV), assistant manager of IT IP clinical applications information systems. The health system ended up choosing Carestream’s Clinical Collaboration Platform for universal data storage and access. The system allows the health care facility to capture images across departments, modalities, and file formats using existing systems, mobile and remote devices, video, and document scanners, among other methods. It also offers vendor-neutral support for future imaging technologies. Clinical content can be captured throughout the enterprise using imaging equipment, smartphones, tablets, and other web-enabled mobile devices. Forsythe says the images are simple to upload, and the PACS allows for customization. In addition, the health care system’s IT staff no longer needs to burn CDs for patients. Using secure logins, patients can access the system to pull up their records and e-mail them to any physician. The physicians can do the same and view the patient’s images for a limited time. Other viewers are being used for specialties such as mammography, nuclear medicine, and advanced visualization, to name a few. “Having archiving and worklist technologies designed to best consolidate and manage this clinical need across disparate viewing technologies can greatly simplify a department,” Rice says. He notes that challenges associated with image distribution, access to priors, image change management, and other issues can be solved with the right technologies. By taking these technologies across departments and the enterprise, the value is compounded, he adds. Image enabling the EHR from a single source vs multiple PACS archives is simplified, and securely moving storage and data center needs to the cloud, if desired, can be simplified by leveraging AI, Rice says.